I can't say that I sit around questioning God. I've always been the type to just believe. God said it. It must be true. When there is trouble in this life, I accept that it is nothing more than something we should EXPECT. We shouldn't be surprised and be so quick to blame God when we feel pain. Whether it be physical, mental, emotional or spiritual, we will feel pain. We will experience trouble and heartache. We shouldn't be shocked when something bad happens to us or others around us. Are we entitled to feel pain and anger and sadness over the things that this life holds for us? But what I am saying is that we need to learn to just accept life for what it is. As long as we are here, we will have troubles. Jesus promised us we would, in fact, experience trouble. So, as long as we KNOW we will have trials and pain, why don't we practice living and trusting God THROUGH the trouble? I have herniated and semi-bulging discs throughout my cervical, thoracic, and lumbar spine. The herniated discs are in my neck, between C5-C6, and C6-C7. At least, that is what the last MRI, almost 2 years ago, showed. And since I went back to work, it has worsened. It is almost as if constantly typing for hours on end has only accelerated the deterioartion. I shouldn't really be surprised. I am going for a new MRI on Thursday morning, to confirm my suspicions. I am having more neurological symptoms than I was when I saw the neurosurgeon a year and a half ago. There is pain, numbness, tingling, and what I can only describe as a feeling of heaviness in both of my arms and my hands. When the Gabapentin (Neurontin) I'm taking three times a day wears off, after only about four hours, my hands and arms being to feel "thick." I can't think of another way to say it. Because of these worsening symptoms, I have a really hard time typing outside of work. On my lunch breaks, I need a break from typing; so blogging then is not an option in my mind. Even now, on my short break, my hands hurt as I type this. It will take me at least 2 days just to write it. And when I get home at night, the last thing I want is to get on my laptop. It's all I can do not to suffocate in the pain at night, as it progressively gets worse throughout the day. The same is true on the weekends. So I find myself only able to post a few times a month now. It keeps me from doing what I normally enjoy. Paul wrote: "...So to keep me from becoming proud, I was given a thorn in my flesh, a messenger from Satan to torment me and keep me from becoming proud. Three different times I begged the Lord to take it away. Each time he said, 'My grace is all you need. My power works best in weakness.' So now I am glad to boast about my weaknesses, so that the power of Christ can work through me. That's why I take pleasure in my weaknesses, and in the insults, hardships, persecutions, and trouble that I suffer for Christ. For when I am weak, then I am strong." 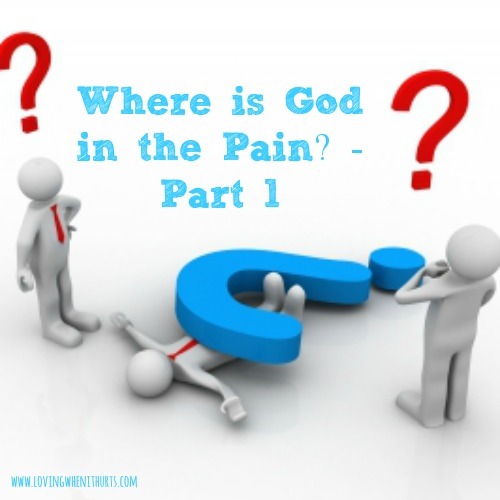 What if God doesn't want to heal my pain? "My grace is sufficient"... I repeat that to myself so often. I understand the pain and frustration that comes with living with constant pain. Sometimes I don't feel like it is even really living.. it seems more like just trying to survive. Often the most pain comes from being unable to do things I want to do and enjoy being with my children. I can't hold them, wrestle with them, play with their hair, and hate having them see me in pain. I just say to myself "My grace is sufficient" and look back at the years He has brought me through. The days that I think I just can't do it anymore and can't imagine making it another week or year and then seeing how God has carried me through the last 16 years gives me hope and peace. He was sufficient all those years and He will be tomorrow. I will be praying for you and for God to show you how to live through the pain and not just survive.